A great shopping experience in any city you visit is just the right icing on the cake. Laad Bazaar, the oldest market of Hyderabad that is located in one of the four main roads leading off from Charminar give you just the right kind of experience in shopping in Hyderabad. The word “Laad” means lacquer which is used to make different types of bangles. This popular market is about 1 km long and it is close to major landmarks such as Chowmahalla Palace, Charminar and Makkah Masjid. This old market has been in operation since the time of Nizams and Qutib Shahis. 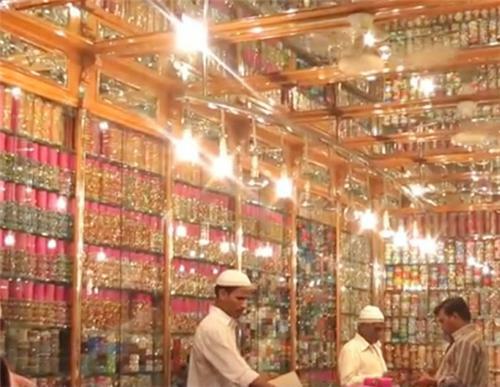 Laad Bazaar is much popular among the people for artificial jewelry, Kalamkari paintings, traditional Khara dupattas, gold embroidered fabrics, lacquer bangles, perfumes, spices and semi-precious stones. Moreover, the bazaar is occupied with many bangle stores selling bright and colourful bangles to the people. At the corner of the road, you will be able to see expert vendors who are involved in arranging the bangles including plain and metallic. These stunning bangles are worn by celebrities of leading television channels and so it has now becoma fashion statement for many. Apart from mono colour bangles, there is a special variety named lac bangles that is much popular in Laad Bazaar. These beautiful handcrafted bangles are coated with glittering coloured stones and shopkeepers design the bangles according to the need of customers. The price of the stunning lac bangles ranges from Rs 1,200 to Rs 10, 000. It is important to know that it takes more than three hours to make a lac bangle and around 6-7 people are required to complete it. In addition to lac bangles, Laad Bazaar is also famous for silver and brass bangles with stones embedded in them. These types of bangles are especially made for weddings and festivals. Usually, people will purchase these colourful bangles during the time of Ramzan as the city is crowded with more Muslims. Lac Bangles are in high demand among many international countries that includes Middle East, America, Europe and Canada. Laad Bazaar is considered to be the biggest bangles market of India which is more than 400 years old. Customers can avail shining and sparkling bangles starting from range of Rs. 6 to Rs, 10,000. 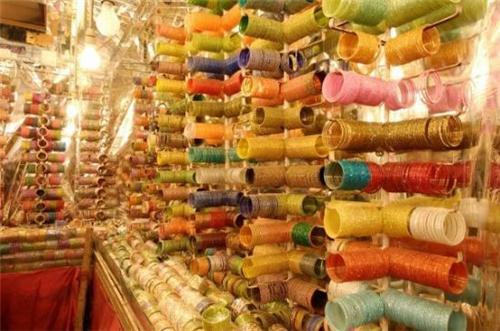 Apart from bangles, there are shops laden with zari borders, mehendi, hairclips, nail enamels, glitter and laces. The narrow alley of the market is crowded with hundreds of people and the authorities have given permission for motorcycles, bicycles, scooters to enter. Rickshaws and cars have been strictly barred by the authority. Before entering into the Choodi Bazaar, ensure to sharpen your bargaining skills to a great extent. Here, the shopkeepers stand at the entrance of the shop begging the passengers to enter into their shop. The great demand for bangles has enabled the industry to offer employment for many people in areas of design and retail selling in shops. People interested to buy authentic Indian outfits can enter the shops that offer traditional clothes like Khara dupattas, handwoven silk and cotton materials. The shop owners ensure to keep their shops furnished with a clean, cotton mattress covering the entire floor. Customers entering the shops usually leave their shoes at the entrance and sit on the mattress comfortably. If you have missed to visit this eminent shopping centre, then just plan a trip and experience a lovely shopping! I love these bangles from Laad bazaar Hyderabad.Hiw can I get them on line.Many of the bangles are out of stock.Kindly let me know how do I get them.